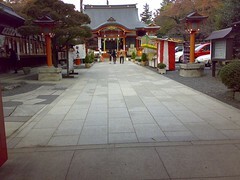 Today I moved from Hibiya Park to Higashi Fushimi, Nishitokyo, just on foot. I took part in the program Japanese Trade Union Confederation had hosted for training workers who worked in the center of Tokyo to know how to return home if no public transportations became available due to an earthquake or other disasters. 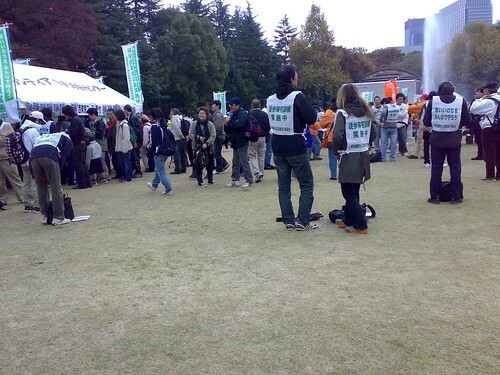 More than 500 people including me started walking from Hibiya Park at 10 am this morning for Nishitokyo. We walked about 20 kilometers on Uchiboridori, Shinjuku-dori and Ome-kaido streets for more than 4½ hours including lunch break. It was very tough for me to walk on the street for many hours because I usually drive a car or take a train to move somewhere instead of walking, but this event was very exciting because I could see many things that I missed while driving by car, and because it was proven that I was still young enough to be able to walk 20 kilometers! 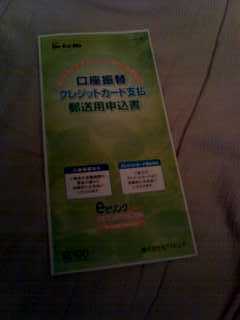 I uploaded some pictures of this event on Flickr. 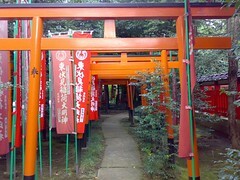 See also: Higashi Fushimi Inari Shrine located near the finish point, with sembon torii (thousand torii) like Fushimi Inari in Kyoto.